Learn how to create lino print landscape pictures in this lino print making course, with Lee Wright an experienced printmaker and teacher. Your image will be built up in layers from one piece of lino using a technique known as reduction lino printing. -Introduction to traditional lino printing techniques and concepts. -The tricks of creating depth and atmosphere in your landscapes. -Cutting and printing your lino in 3 layers to create your own lino printed landscapes. The January course will take inspiration from winter landscapes and colours, the June course from spring and the September workshop will be inspired by autumn. This print making course is suitable for everyone from complete beginners to those who have done some print making before. 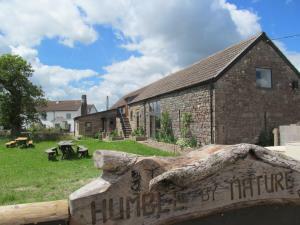 Humble by Nature is based just outside of Monmouth in the Wye Valley. Easily accessible, situated close to the M4, M5 and M50. Take the A40 Southbound exiting at Monmouth, follow signposts to the B4293 directing you through two left turns towards Trellech/ Chepstow. After the series of bends the road straightens and at the top of the hill, with views on your right, take the first left hand turn, signposted towards Penallt. Continue for approximately 1 mile, taking the next available left - signposted 'The Craig/ No through rd'. Humble by Nature is the first entrance on the left. Exiting the M4 towards Chepstow and the Old Severn Crossing, follow signposts along the A466 to Chepstow Racecourse. At the Racecourse take the first exit at the roundabout signposted B4293 to Devauden. Continue along this road passing through Devauden, Llanishen and Trelleck. Almost 3 miles after Trellech, with magnificent views on your left, take a sharp right signposted Penallt. Continue for approximately 1 mile, taking the next available left - signposted 'The Craig/ No through rd'.